Wash sesame seeds and soak untill it give all the water , then take them on a pan and saute sesame seeds on very slow flame for 2 mins until it gives some good smell , take them into another bowl , now add red chili , cumin seeds , coriander grains , curry leaves , fenugreek seeds , mustard seeds saute them 2 mins . Now wash capsicum and wipe them with kitch towel and make a cross cut upto 60 -70% (so that you can easily stuff the masala ). 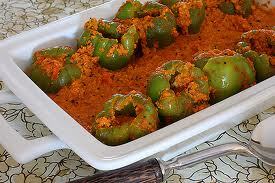 Delicious sesame stuffed capsicum curry is prepared .